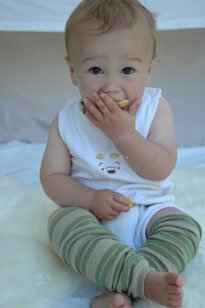 BabyLegs are legwarmers for babies. They make diaper changing a cinch and keep your baby's legs warm since you don't have to take any pants off. Since winter is just around the corner, I ordered them for Christian. Aren't they adorable?! And, I think they'll be great for when he's crawling around to protect his precious little knees. 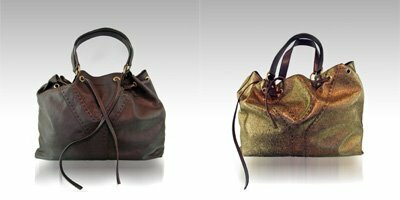 "The dual handle, fully reversible bag is accessorized with a few rings of gilded metal, closed by a leather thong which can be reattached to either side of the bag, and enhanced by a wide over sewn Y-shaped seam in gradient shades. Made of smooth Indian leather from Madras, known as Mercurio, the skin is tanned with chrome and then coated with a metallic leaf to achieve the anthracite or bronzed effect." Ben bought it for me on my birthday to use as a diaper bag. I must say, I love it. The leather is soft and the purse is extremely light. And the best part is it's reversible! I got the black / anthracite. The picture shown above is the Brown / Bronze. But keeping things organized in your purse is a challenge. Especially when you're mixing up your makeup bag, teething rings, burp cloths, cell phone and wallet. 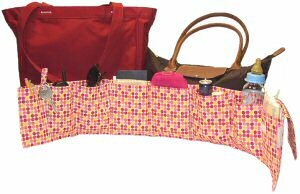 So, I got me a purse organizer from Purseket. I got the medium size one but I think I need the large so I'll be ordering another one this week.